PANDIT Bhimsen Joshi needs no introduction. One of the prominent Hindustani vocalist living legends, Panditji has not just won a huge fan following but has also won over his critics. The vocalist was honoured with Bharat Ratna on November 4 this year, an award long overdue to one of the greatest doyens of Hindustani classical music in the country. This is a culmination of the awards he has collected over time. He won the Padma Shri (1972), Sangeet Natak Akademi Award (1976), Padma Bhushan (1985), Tansen Samman from Madhya Pradesh (1998), Padma Vibhushan (1999), Maharashtra Bhushan (2002) and Karnataka Ratna (2005.) The Bharat Ratna conferred on him makes Pandit Bhimsen Joshi the first Hindustani classical vocalist to have received this title. Born on February 4, 1922, in Gadag, Karnataka, Pandit Bhimsen Joshi ran away from home when he was just 11-year-old, in search of a good music teacher. Since he had no money for the train fare, he sang in the compartment to entertain his fellow commuters. They gave him money for singing, which got him a ticket for the journey. The young boy went wandering across the whole of North India, travelling to Gwalior, Kolkata and Rampur. His rigid father had refused him permission to learn music. But Panditji’s father relented later and the father and son were reunited when the talented vocalist came home after three years. In 1936, he became the disciple of Sawai Gandharva, the foremost disciple of Ustad Abdul Karim Khan Saheb, whose music had mesmerized Panditji in Gadag when he was a small boy. It had inspired Joshi to sing like him. A portrait of his guru still hangs on the wall of Pandit’s room. His music lessons began with a rigorous riyaaz for 12 hours every day. This invested his voice with a unique depth. In keeping with the conventional guru-shishya parampara, Pandit Bhimsen Joshi lived with his guru. Khan Saheb was the founder of the Kirana gharana of which Pandit Bhimsen Joshi is a living legend. Panditji met vocalist Begum Akhtar there. She got him a job as staff artiste at the Lucknow station of the AIR. Panditji gave his first live public performance in 1941 and cut his first record in 1942. The songs were an interesting mix of devotional songs in Hindi and Kannada. In 1943, he shifted base to Mumbai. The turning point of his career was his performance at a concert to celebrate the 60th birthday of Sawai Gandharva in 1946. The performance won accolades from the audience and also from his guru. 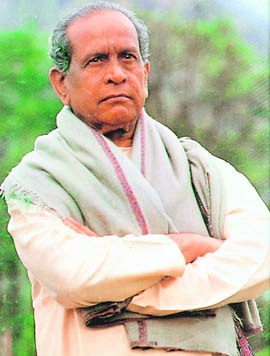 Pandit Bhimsen Joshi became the most popular exponent and practitioner of this gharana of Hindustani classical music. One rarely encounters a singer who is as popular in Jalandhar and Amritsar as he is in Kolkata and Chennai. Today, he conducts the annual Sawai Gandharva Music Festival in Pune in memory of his guru where he sang last year. He sings only a dozen ragas like Todi, Lalit, Yaman, Malkauns, Multani, Puriya, Puriya Kalyan and Marwa. But he sings them with such perfection and artistry that is difficult for other musicians to come anywhere near him. Though he has remained rigidly loyal to the Kirana gharana, his innovative inclinations has led him to mix influences of singers like Amir Khan and Kesarbai Kelkar. He has stopped performing over the past six or seven years due to his failing health. His interaction with Hindi film music has resulted in some rare diamonds such as the duet Ketaki gulab juhi with Manna Dey in Basant Bahar under the musical baton of Shankar-Jaikishen and two songs in Amol Palekar’s Ankahee under Jaidev’s baton that fetched him the National Award. His most memorable performance that is remembered till date is of course the national integration song Mile Sur Mera Tumhara. Panditji has created several new ragas, including Kalashree, Lalit Bhatiyar and Marwa Shree. He composed the music for several Marathi plays during the 1960s. In the 1970s his bhajans, especially the Santawani comprising compositions of Sant Dhyaneshwar, Tukaram and Namdev, became extremely popular. His performances are an unforgettable learning experience in cultural entertainment of the purest form. His abhangs, sung to packed theatres, would find him swinging with the rhythm, stretching and moving in trance like a devotee in his search of God. He gets so much immersed in his music that he forgets everything else around him – his musical accompanists, the stage, the audience, everything. It would not be an exaggeration to say that it is award (Bharat Ratna) that has been glorified by its recipient rather than the other way round.